-Dimensions: 5.75" x 5.38" x 2.63"
The Beatles Mono Box Set was compiled as a special interest package for the hard-core fan. 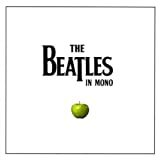 It presents the first ten albums in re-mastered mono (the final 3 albums made their debuts in stereo only), and a double album of singles and EPs, called "Mono Masters". At the time of writing, the mono albums are not available individually.